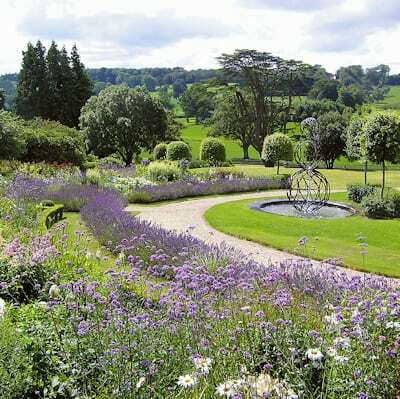 Situated on the Southern edge of Exmoor in the small village of Filleigh, Castle Hill offers visitors a great garden experience whatever the season. 50 acres of historic parkland set against the breath-taking 18th century Palladian Mansion house built as the Earl Fortescue’s family home, the gardens feature pathways, temples, follies and stunning vistas. Start with a walk through the Millennium Garden designed by Xa Tollemache with its striking water feature and then on to the Walled Garden. The path then leads across the formal terraces in front of the house where the eye is drawn to the distant Triumphal Arch and recently restored Holwell Temple. Wander through the Woodland Gardens, often a riot of colour with rhododendrons, azaleas, camellias, magnolias and an abundance of shrubs and trees. Stroll down to the river and admire the majesty of the Ugley Bridge and Satyr’s Temple before a final walk to The Kennel, a memorial to Lady Fortescue and a celebration of 660 years of the Fortescue family living at Castle Hill. An energetic climb to the castle offers panoramic views to Exmoor, Dartmoor and Lundy Island, creating an appetite for the delicious cream tea available from the tearoom and the perfect way to round off a visit. Dogs on leads welcome. Opening times: Open daily except Saturdays, 11am to 5pm. Winter Opening hours 11am to 4pm. Refreshments available April to October. Groups and coach parties are welcome at all times by prior arrangement. Facilities: Light lunches and cream teas in the tearoom. Gifts and plant sales. Disabled Access: Limited. Gravelled pathways and some areas are only accessible by steep paths.